← Were the Founders of America Zionists? DHS has declared War on U.S. Citizens, a reprint from anonymous sources………. Welcome to the Fatherland, where there is no constitution, no justice and, at the present moment, no future. Our way of life, our culture and even our lives are in jeopardy if we do not quickly reign in an out of control and potentially deadly Department of Homeland Security. Did anyone else remember when the announcement was made that a new federal agency, an agency we did not need nor an agency that we could afford, was going to protect us from terrorists? Did any of you have a negative reaction when it was revealed that the name of the agency was the Department of Homeland Security (DHS)? Did you immediately think about Nazi Germany and “Der Fatherland?” I don’t know about you, but I do not want to live in a “Homeland” or a “Fatherland”. I want to return living in a Republic. Did you know that DHS paid ex-East German Stasi head, Markus Wolf, millions of dollars to set up the organizational structure of DHS? Did you have a “what the hell” moment the first time you saw DHS Director, Janet Napolitano, roll out her see something, say something Stasi civilian spy on your neighbor program? Do you avoid flying because of the invasive sexual molestations that the TSA subject the public to? If so, blame DHS, they oversee the TSA who hires pedophiles, felons and just general perverts. Did you know that the Federal Emergency Management Agency (FEMA) is an agency of the United States Department of Homeland Security and we will get into why this significant later in this article. DHS is not your friend. They are not combating foreign terrorists. Their mission is not to protect you from Al Qaeda. Their mission is to protect the global elite from you and your anticipated failure to submit to the tyranny being rolled out across the country in the form of an administratively imposed martial law. I am not going to mix words in this report, DHS is an enemy of the state, the legitimate state, not the state that has been hijacked by foreign bankers on behalf of the globalists. Janet Napolitano is a domestic enemy of the state and she serves under a foreign enemy of the state, “President Obama.” As American citizens, we are duty bound to defend the country from enemies both foreign and domestic. I just identified two of our main enemies. Napolitano and Obama constitute a national security threat against the Republic and its guiding government document, The United States Constitution. For the readers who do not think that the globalists who have hijacked this government will not hesitate to use deadly force against the American people who refuse to capitulate to the roll out and full implementation of the police state surveillance grid, then ask yourself why, since last year, The Department of Homeland Security has stockpiled more than 1.6 billion bullets, mainly .40 caliber and 9mm. Who could these bullets be intended for? Are there 1.6 billion terrorists preparing to board airplanes and use them as weapons? 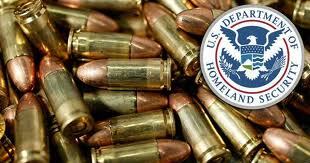 No wait, DHS just announced an additional purchase of 21.6 million rounds of ammunition to add to the 1.6 billion bullets it has already obtained over the course of the last 10 months. Are we supposed to believe that we are looking at a sudden influx of violent and dangerous 1.6 billion illegal aliens to America? Or, maybe, there are 1.6 billion violent and dangerous drug dealers in America. But there’s more, DHS just purchased 2,700 Mine Resistant Armor Protected Vehicles (MRAP). Since DHS was responsible for the creation and dissemination of the MIAC Report, it has been decided that YOU, Mr. and Mrs. America, are the new terrorists and it’s your fault and you are deserving the terrorist label being forced upon you. When the globalists demand that you drink the fluoride in the water, eat unlabeled GMO’s without whining, breath the chemtrailed air, make your children take mercury laden vaccines, allow your savings to be debased by a criminal group of private bankers who print worthless money and give it to themselves and then call it a bail out, fight illegal wars of occupation, accept their Eugenics based national health care system, lay down and let the megabanks steal your homes through the MERS fraud, train Russian troops on our soil in preparation for gun confiscation, demand that you give up your guns, believe that their false flag attacks on Columbine, Sandy Hook and the Aurora Batman Massacre are real, then by-God you better start drinking from the Kool-aid and start believing the lies and misinformation or you will be declared a terrorist and you will be secretly arrested or be murdered by a drone. According to DHS documents, you are a terrorist if you possess certain formerly protected constitutionally protected beliefs. So I decided to give myself the DHS terrorist checklist quiz. 1. X Ron Paul Supporter. I used to be an ardent supporter. 2. X Supports the Second Amendment. I am not giving up my guns to the Russians, DHS or anyone else. 3. X Supports the Constitution. I am guilty as charged. There is more, but you get the idea. If you, like myself, profess a belief in any of the above positions, you are a domestic terrorist. Do you know what DHS plans to do with domestic terrorists who refuse to go along to get along? The following is a cross-section of planned actions against you for your politically incorrect beliefs. The U.S. Department of Homeland Security has customized its Predator B drones, originally built for overseas military operations, to carry out at-home surveillance tasks that have civil libertarians (i.e. domestic terrorists) worried. The new drones can identify American civilians carrying guns and tracking their cell phones, as the latest redacted government documents show. Alan Gottlieb, founder and executive vice president of the Second Amendment Foundation, in reference to the Predator B drones recently stated that “I am very concerned that this technology will be used against law-abiding American firearms owners,” and further stated that “This could violate Fourth Amendment rights as well as Second Amendment rights.” New flash, Mr. Gottlieb, the Constitution is dead and buried deep beneath the new Fatherland. By the way, predator drones can fly for up to 20 hours and carry a payload of about 500 lbs, have facial recognition software, can be programmed to be fully autonomous, and can track your cell phone and intercept your emails. What will you fight back with if and when you are placed on the MIAC terrorist watch list and they come for you? I almost forgot to mention, Mr. Gottlieb, that DHS is also purchasing thousands of full-auto assault rifles, calling them “personal defense weapons,” while at the same time, trying their best to deny US citizens their lawful Second Amendment right to defend themselves with the exact same weapons. But it is OK that DHS is straddling both sides of the fence, because hypocrisy and duplicity are not crimes in the new AmeriKa. Since we are speaking about automated assassins of innocent Americans who will not accept the globalists’ form of tyranny, I would be remiss if I did not mention the new killer robots which are also being brought online. They run faster than a bear, possess facial recognition capability and can be programmed to be autonomous human hunters. Not being of flesh and blood, if you are their intended target, how could you possibly defend yourself? Does anyone think that DHS has programmed these monsters to show any form of mercy? Given the fact that DHS ordered cut out shooting range targets of pregnant women holding their baby along with depictions of children, I don’t think the coming DHS/FEMA purge is going to be very humane, do you? There are hundreds of thousands of multi-body coffins being stored right now at FEMA camp facilities, and there’s also strong evidence that FEMA camps are being activated with core staff coming on line. Thanks to a 2012 report in the aftermath of Hurricane Sandy, the establishment media (CBS) admitted to the existence of FEMA camps. Interestingly, there are even FEMA coffins stored out in the open in rural locations, such as the ones photographed by Sherrie Wilcox. What about these pictures, Janet? America, who do you think these coffins are for? Is it the 1.6 billion terrorists, violent illegal aliens trying to gain entrance into our country or are they for the 1.6 billion drug dealers? Let’s stop pretending America, these are FEMA coffins with many of our names on them. The battle lines have been drawn only most Americans are still unaware that they are about to be the most hunted prey on the planet. Field Marshall Napolitano, on behalf of the globalists, has declared most Americans to be enemies of the illegitimate state. When will be the time for some serious civil disobedience? They say one picture is worth a thousand words. I have some interesting pictures for you regarding the Parkland School shooting in Florida. Research into how to fight the effects of environmental assault: Nano-particals, EMF, H.A.A.R.P., etc.